Maroon 5’s performance on Sunday is quickly becoming one of the most criticized Super Bowl halftime shows in recent memory. But lead singer Adam Levine took off his shirt halfway through. 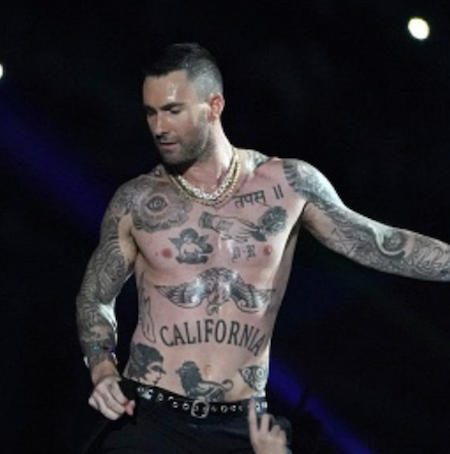 While the halftime show had many swooning over the bare-chested, tattooed, muscle-clad singer, it had some critics wondering why Levine was getting so much positive attention for exposing his chest when legendary singer Janet Jackson was shunned. Les Moonves, the former CEO and chairman of CBS, who resigned last year over a sexual harassment scandal, targeted Jackson as he thought the “wardrobe malfunction” was intentional. stop playing Jackson’s music videos, and all Viacom-owned radio stations, to stop playing her songs. Levine and his band brought controversy even before the Super Bowl. Fans started a petition asking Maroon 5 not to perform in solidarity with Colin Kaepernick. The band instead chose to donate $500,000 to Big Brothers and Big Sisters of America.